"Hi, we're the, uh... Mapple Intelligencia?" Counterfeit technology isn’t a problem in the United States or even most of the world, but in the far East? Counterfeiters are rampant. For example, consider the case of China. It’s piracy central, computer hacking HQ, and the counterfeiters are so brazen they’re even ripping off entire chain store concepts. A sweep by Chinese officials uncovered five fake Apple Stores, including an Apple Store faked so well Apple should just move in after the cops get done. It’s not a KIRF Apple reseller, or a real Apple Store, it’s just an uncanny facsimile. Just check out the video below if you don’t believe me. The resemblance of this Apple Store to every other Apple Store I’ve ever seen is uncanny according to BirdAbroad’s pictures and video. Not only did the hucksters in Kunming get the look and feel of the Apple Store right (even getting the spiral staircase right! ), they even managed to get the right employees. Hipster glasses, bad haircuts, disaffected facial expressions, standing about lazily… it’s perfect! 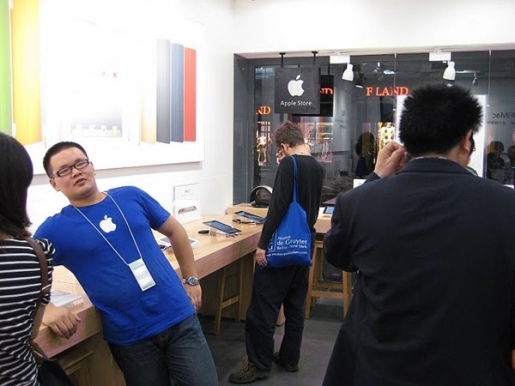 Even the employees believed they were working in a real Apple Store! If that’s not a tribute to the skills of Chinese counterfeiters, nothing is.